This was my first time with Bookaroo in the city, and as all new things go, it was exciting to say the least. 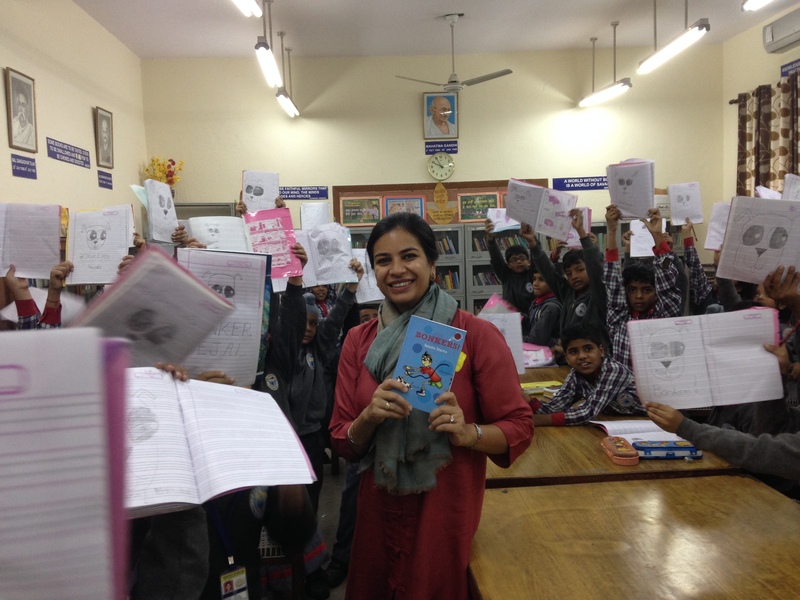 With a rushed three days in Delhi, my mornings began with readings from my recently released book, Bonkers! (Duckbill books). I read to groups as large as 150 students at the Kendriya Vidyala at Tagore Garden and the Andhra Education Society school. I was delighted to see the open-mouthed expressions on the children’s faces when I related childhood escapades with my dogs. The children joined in with all their enthusiasm as they counted the number of animals versus people in my childhood home (it was something like 39 versus 6 at one point!) and the number of ‘TANGS’ the doggie bowl hurled down sounded out. After real and fictional episodes, I led the children through a step-by-step demonstration of drawing their own Bonkers! Excited comments, questions and ‘see mine, see mine!’ peppered this bit. We had many adorable Bonkers coming to life in their notepads. Kudos to the Bookaroo team. Things moved like clock work. Thank you to the teachers and students for letting me be a part of their day so warmly. To a great Bookaroo ahead! Click here to know more about the upcoming Bookaroo in Delhi (November 23-24) and Bookaroo in Pune (November 30-December 1).